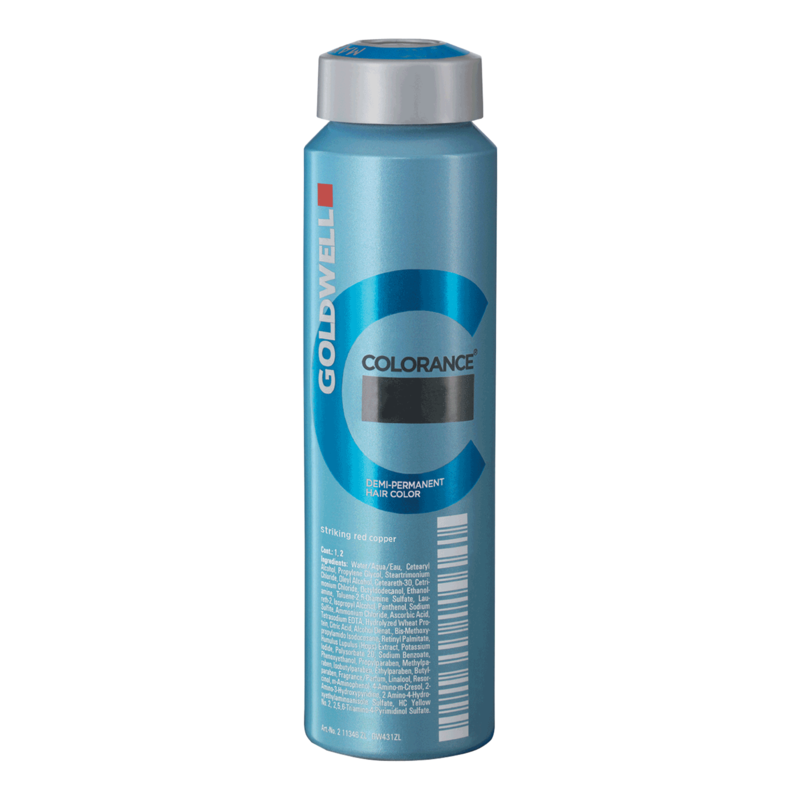 Colorance acid hair color was introduced by Goldwell in 1986. It was the first acidic hair color to contain an oxidative pigment that could develop in a non-alkaline environment. Colorance contains natural plant extracts and hydrolyzed wheat protein to protect and care for hair. Colorance delivers brilliant color the gentle way, to every client’s hair. Colorance Demi-Permanent Hair Color - As a professional, you know the healthier the hair, the more beautiful and shining the color result will be. Colorance is the first demi-permanent hair color with IntraLipid* Technology that repairs the hair during the coloration service. 1. Shampoo with Goldwell DualSenses color fade stop shampoo. 2. Thoroughly towel dry hair and apply Colorance mixture evenly from scalp to ends. 4. Upon completion of the processing time, lightly rinse and gently work into a lather. Rinse thoroughly until the water runs clear. Do not shampoo. 5. Finish with Goldwell DualSenses color detangling conditioner for color-treated hair. Follow up with DualSenses color lock serum for color treated hair. * Heat is optional for use in processing when grey blending or when applying a standard Colorance service. Heat, in some cases, may increase color intensity. Do not use heat when Color Perming or Toning on highlights. Recommended processing when using heat: 5-20 minutes with moderate open-air heat. Cool down for 5 minutes. Plastic cap not necessary. Colorance is mixed in a 2:1 ratio. Recommended standard mix is 40mL Colorance Lotion to 20mL desired Colorance shade. Amounts should be adjusted for longer or shorter hair with the same 2:1 ratio. Always dispense lotion first and then add in the appropriate amount of Colorance shades. Colorance is available in two choices: the economical 120mL depot canister, with 6 applications per can; or convenient 60mL tubes, with 3 applications per tube. An excellent way to create beautiful shine, vibrancy, and condition on any client. Colorance Core range of warm and cool blondes, browns and reds. - N shades for up to 50% grey/white coverage. - MaxReds and Mix shades. - Cool Protect Technology in all Cool Brunettes and Cool Blondes. - Application with Goldwell brush Applicator tip or nozzle. "Amazing color. Leaves hair silky."